The fashion retail chain C&A aims to keep its doors open all year round. Open doors means hospitality and a warm welcome. However, things are not always that simple. 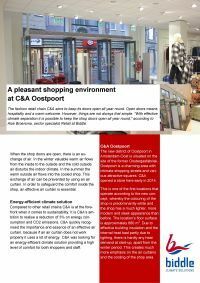 "With effective climate separation it is possible to keep the shop doors open all year round," according to Aize Broersma, sector specialist Retail at Biddle.